Thousands of farmers, like 45-year-old farmer Juan Joaquin Luna Vides, prefer to source their seeds locally, and not to use Monsanto’s GM seeds. “Transnational companies have been known to provide expired seeds that they weren’t able to distribute elsewhere,” said Vides, who heads the Diversified Production program at the Mangrove Association, a community development organization that works in the Bajo Lempa region of El Salvador. “We would like the US embassy and the misinformed media outlets [that are pressuring the Salvadoran government to change their procurement procedure] to know more about the reality of national producers and recognize the food sovereignty of the country,” he added. “MCC is fueling economic growth in El Salvador’s Northern Zone through technical assistance, rehabilitation of roads, credit, and investments in people, including vocational education, better water and sanitation services and an improved energy supply,” according to the agency’s website. However, in late 2013, the US government made it clear that without “specific” economic and environmental policy changes, it would not provide the $277 million in aid funding it had promised to give El Salvador, via the MCC. In the following months, it became evident that these reforms included a policy change that would shift the country’s current method of providing seeds to its farmers. 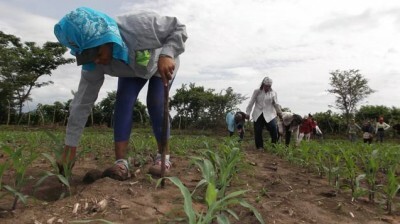 In stark contrast to what the US government is attempting to do by forcing farmers around the globe to purchase Monsanto GM seeds, Salvadoran farmers like Vides have been working with the government, alongside NGOs like the Mangrove Association, to provide certified corn seed for agricultural packets that are distributed to thousands of Salvadoran farmers. The program has been ongoing for more than five years in the country, and is continuing to expand. Vides, along with hundreds of other farmers and their coops, has successfully produced high-quality seed that is adapted to the specific soil and climate conditions of their country. He notes that using indigenous seeds simply makes more sense agriculturally and economically. Nevertheless, there has been an ongoing effort by the US government to work on behalf of multinational companies like Monsanto in pushing their GM products on the government of El Salvador. In 2013, Food & Water Watch, a Washington, DC-based watchdog group, issued a report that detailed how the US State Department issued directives to US embassies to promote biotech products and be responsive to the concerns of the biotech industry. “Between 2007 and 2009, the State Department sent annual cables to ‘encourage the use of agricultural biotechnology,’ directing every diplomatic post worldwide to ‘pursue an active biotech agenda’ that promotes agricultural biotechnology, encourages the export of biotech crops and foods and advocates for pro-biotech policies and laws,” the report said. “The State Department views its heavy-handed promotion of biotech agriculture as ‘science diplomacy,’ but it is closer to corporate diplomacy on behalf of the biotechnology industry,” the watchdog group added. Monsanto, which describes itself as “A Sustainable Agriculture Company,” is a massive multinational corporation well known for deleterious practices like suing small farmers when Monsanto seeds have blown into their crops, using “suicide seeds” (also referred to as terminator technology, these are seeds that have been genetically-engineered so that when the crops are harvested, all of the new seeds produced from these crops are sterile, which then forces farmers to buy seeds annually from Monsanto in order to continue growing their crops)and altering the genetic structure of natural organisms and then patenting these seeds. The company’s concentrated control over the seed sector in India, as well as much of the rest of the world, has caused tens of thousands of farmers to go out of business, and triggered a spate of related suicides. Farmers in Brazil are suing Monsanto for $2.2 billion for unfair collection of royalties – and this is just one among countless lawsuits against the company, which maintains extremely close ties with the US government. Sixty-five-year-old farmer Manuel Cortez has been farming the Lower Lempa region of El Salvador since he was a small child. Cortez is the president of the La Maroma Cooperative, which is made of up 150 rural families and manages over 940 hectares of farming and pastureland. The cooperative has been using 140 hectares for certified corn production for government contracts. Together with five other local coops, this farming area grows over 45 percent of the government of El Salvador’s certified corn supply, specifically with the H59 certified corn seed, which is under threat by Monsanto’s GM corn seed that the US government is pushing the country to use. Cortez explained that his coop and those he works with receive credit at the national bank, which relies on government contracts as collateral. According to Cortez, all the local farmers prefer the certified corn seed his coop is producing, and the US government should respect that. Truthout asked Weller, who has been working with rural communities in the Lower Lempa area of El Salvador for 18 years, what he thinks the most sustainable course of action might be for Salvadoran farmers. EcoViva has supported the capacity building of five local cooperatives currently participating in the corn procurement process. Weller explained that the local H59 corn variety is grown under climatic and growing conditions that make the seed more suitable to the region. “This lends it toward higher yields without the need to apply the same expensive, harmful additives that Monsanto products generally require,” he said. According to Weller, the government of El Salvador’s current ability to procure seed from local producers, who offer the best product at the cheapest price, has led to record corn yields in 2013. “This has also led to a record outreach in national farming programs, and an injection of nearly $25 million total into the rural economy, creating hundreds of rural jobs,” he said. CONFRAS states that from 2004 through 2009, farming inputs were delivered to Salvadoran family farmers with one primary purpose: to generate business to major importers of seed and other inputs, particularly to the seed producer Semillas Cristiani Burkard, a Monsanto affiliate. As a result of widespread and mounting resistance to Monsanto seeds across El Salvador, the US government might now be softening its stance regarding its attempts to tie the $277 million aid deal to the requirement of the use of Monsanto GM seeds. Due in large part to the organization and resistance from the Salvadoran farmers, the US government appears to be leaving the GM seed requirement out of the aid deal. However, even if that is the case, the US government could, as it has often done in the past, attempt to find another El Salvador aid package to tie the required purchase of Monsanto GM seeds. At the time of publishing, Monsanto had not responded to Truthout‘s request for comment.